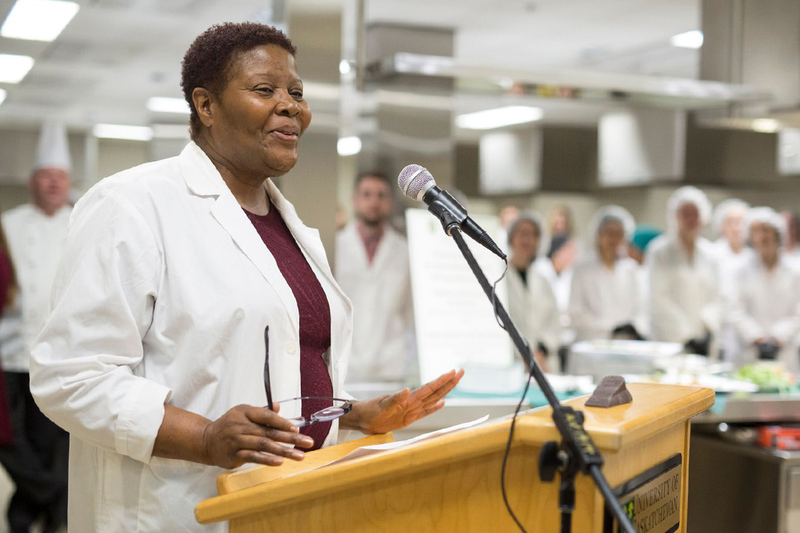 Carol Henry speaks at the opening of the undergraduate nutrition lab in the Health Sciences Building (photo by David Stobbe). For Carol Henry, one word can open up a lot of doors. “Food—just that one term generates so many things,” said Henry, the assistant dean of nutrition and dietetics, as well as a professor within the division. The subject of food is at the forefront of the College of Pharmacy and Nutrition’s undergraduate food lab, newly-opened on March 3 in the B-wing of the Health Sciences Building. Complete with a large commercial kitchen comprised of 24 cooking and prep stations, adjacent research space and seminar rooms, a commercial dishwasher, and an expansive storage area with a walk-in fridge and freezer, the space provides students with a modern environment to practice their skills in nutrition research and food service training. First and foremost, Henry explained, the lab has to be a training ground for students, tackling the hands-on skills needed for a career in nutrition and dietetics—such as creating modified meal plans or safely wielding a kitchen knife. “But we also want, through our programs, for it to be an outreach into the communities,” she continued. While “we haven’t figured all of this out yet,” she noted that organizations such as the Friendship Inn may benefit from the lab’s “planned overages” through donations of food. Thinking at a macro level, Henry hopes the lab also encourages students to think more critically about the role of food in society. Speaking passionately about global food systems and health promotion, she sees the potential for the lab to address issues of food security locally, nationally and even internationally. Henry used a common household staple—milk—as an example. The issue permeates further to developing countries like Ethiopia and Uganda, where Henry has also done considerable research on food security and food systems. Fortunately, when it comes to food research, there are many interdisciplinary connections to be made. While research and education links within the health sciences make sense, “we’re also connected to the College of Agriculture and Bioresources—because we have to eat food,” said Henry. Similar links exist with the College of Kinesiology. “When you look at health, the environment, nutrition and physical activity, there’s a natural link there as well,” she said.